SCD Group: Is Multitasking a Myth? Association executives face multitasking challenges daily. Personally, I've labled them as switch-tasking ( term I "borrowed.") See Switchtasking into 2013: confessions of an association professional. Nevertheless, this post from Mandi Sonnenberg, should be helpful to most association professionals. With all of our techno gadgets, it's pretty easy to fall into the trap of multitasking. Often we feel the need to respond quickly to a few emails in the latte line, or glance at our friend's social media status while filling up our tank. How about checking the score of your favorite sports team while you should be watching your friends or child play on the field? 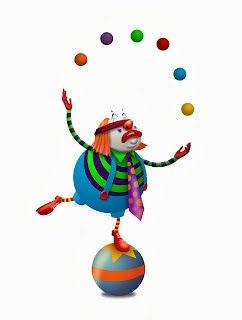 Just how many things can one juggle at once? they involve different types of brain processing. For example, you can read effectively while listening to classical music because reading comprehension and processing instrumental music engage different parts of the brain. However, your ability to retain information while reading and listening to music with lyrics declines significantly because both tasks activate the language center of the brain." We hear how wonderful it is when one can multitask, that person who can do it all well and get it done quick...right? Dr. Clifford Nass, a professor at Stanford University, would disagree that multitasking makes you more productive. He explains that you actually lose time multitasking, and that it could even be killing your creativity. "The research is almost unanimous, which is very rare in social science, and it says that people who chronically multitask show an enormous range of deficits. They're basically terrible at all sorts of cognitive tasks, including multitasking." Dr. Laura Janusik, a professor at Rockhurst University supports, what she calls, the Be Here Now strategies. She stressed the importance of tackling one task at a time, and being thorough. Only have open what you’re working on…your text, notes, etc. Have one additional blank page near you. When you get an idea of something you need to do outside of class that you don’t have a reminder of elsewhere, like "pick up milk on the way home" or "send professor an email about this term", then jot it down on your "to do" list. Then ignore it. You can’t do it now, and you need to be here now, and you’ve made sure you’re not going to forget it by writing it down. If your digital device is open, only be on the screen that you need to be on NOW. If you’re on a device, only be on the program/page that you need….close out/ shut down all other programs/pages you are not currently using. It decreases temptation. Shut off sound indicators for voicemail/text/Facebook messages. Set a timer for 10 – 60 minutes (your choice). During that time, work ONLY on one project. When the timer goes off, you may check your voicemail/email/Facebook, etc. It seems clear that if you are trying to get through your day multitasking as much as possible, you may just be clowning around.